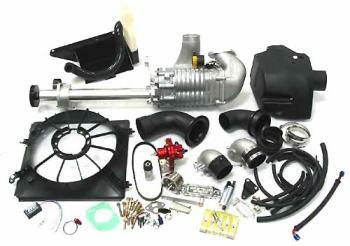 CT Engineering Supercharger - CL/TL ACURA - Dezod Motorsports Inc - Home of the automotive performance enthusiast since 2002. CT Engineering has developed a supercharger kit for the TL/CL and Accord that increases power by 40 to 60 horsepower at the wheels depending on the model of car. The supercharger uses a “Eaton-type” design that provides consistent boost and compresses the intake charge efficiently with a minimal increase in the intake air temperature. This combination provides almost instant boost that increases low and midrange torque for excellent throttle response. The kit is complete with cast aluminum supercharger manifolds, all mounting brackets, fuel pressure regulator, Ice Box air intake, all necessary hardware and is designed to provide excellent breathing. The kit requires no major modifications and the car can be easily returned to stock. The kit requires the customer to purchase a new, smaller battery. The TL / CL and Accord supercharger kits are 50 state emissions legal. Product enhancements: Additional power and engine response is available with the addition of a CT Engineering header and cat back exhaust system and our lightweight aluminum flywheel for the CL 6 speed manual transmission car.